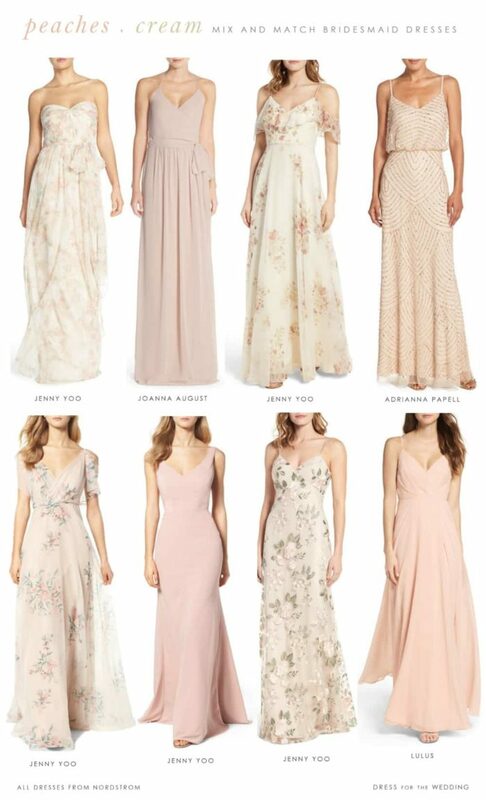 Floral, Peach, Blush and Cream Bridesmaid Dresses to Mix and Match. 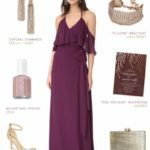 It’s time for another look at a mix-and match bridesmaid dress color scheme in our mix and match series (see our other mismatched bridesmaid ideas here)! Today’s look is perfect for the spring-almost-summer season – it’s a mix of peaches and cream! This color range of blush, cream, peach, and soft blush and pink florals is a unique way to mix up colors for a spring or summer wedding. 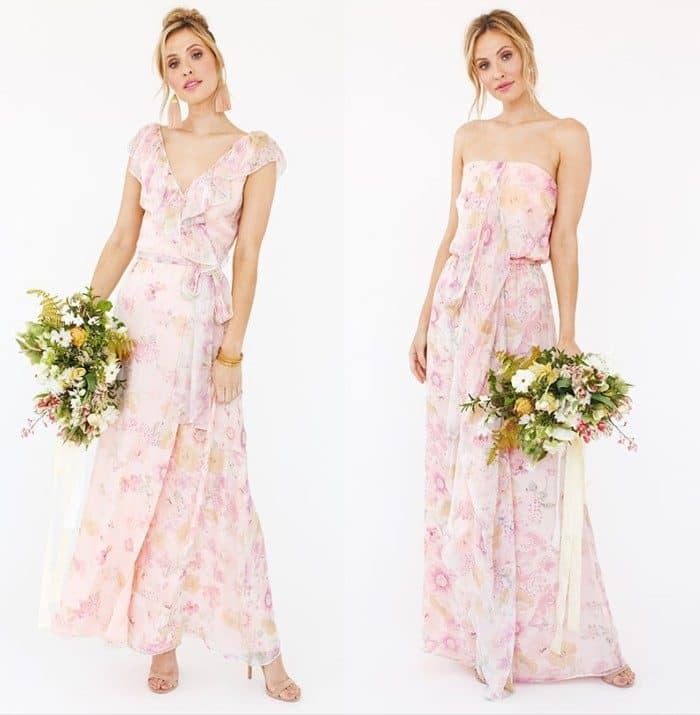 Ivory and cream bridesmaid dresses are re-gaining popularity as a bridesmaid dress color, but if you’re not ready for all your bridal party to wear white, mixing a little peach and blush, or some pretty floral print bridesmaid dresses in blush and neutrals, will break up the look! This floral, peach, blush and cream bridesmaid dresses to mix and match is such a sweet color combo for a garden wedding! 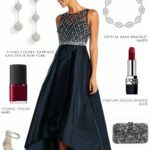 For a bit of sparkle, for a black tie wedding or a more formal look one could also add some sequin gowns in blush or rose gold. 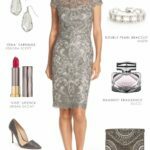 There are a few in this mix, and some on our beaded and sequined bridesmaid dresses shop page, and in this rose gold sequin gown post. Here are some ideas for great dresses to mismatch. Pick 2 or 3 and repeat the style among the ladies in your party, or the whole range – either way, you’ll get a cohesive, blush, peach, cream bridal party color scheme! 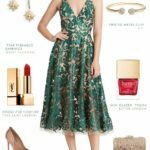 Finding dresses in this color combination is easy – BHLDN, Show Me Your Mumu, and Nordstrom have some of our favorites! 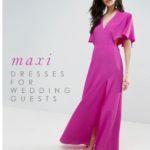 For really affordable dresses also check out the new line of bridesmaid dresses at Pretty by Rory at Forever 21 – that are all under $80! Show Me Your Mumu gowns are the epitome of laid-back elegance! 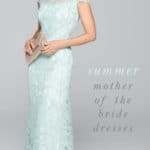 They have a range of dresses that work for this peach and cream mismatched bridesmaid look from a dark coral / rusty rose color to light florals and pretty white and cream gowns. Here are a few of our favorites! See more wedding attire ideas! 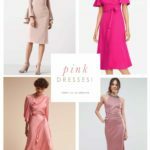 The shopping sources and images for this post about peach, blush, and cream bridesmaid dresses uses affiliate links from our sponsoring retailers. 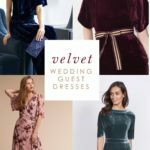 Win a Bridesmaid Dress in the Weddington Way Dress Giveaway!